With cold and flu season activity expected to remain elevated for a number of weeks, it’s not too late to get a flu shot. If you’re already sick, and you’re wondering how to treat the flu or a cold, keep reading. You’ll learn what, and what not, to do once the cold or flu virus strikes. Vitamin C is a common cold and flu treatment, and one of the first things many people reach for when a cold or flu is coming on. There’s little evidence, however, that this popular vitamin has much effect. Some studies suggest that taking vitamin C on a routine basis, beforehand, may help reduce the duration of a cold and its symptoms once you become ill. Taking this common cold treatment after your symptoms have begun, however, has little effect. Surprisingly, one of the best treatments for cold symptoms may be echinacea. After initial research labeled the herb ineffective, newer studies now suggest that it may decrease the odds of coming down with a cold by 58 percent, and reduce a cold’s duration by roughly one and a half days. Don’t take an ice bath. It may seem counterintuitive, but this common cold and influenza treatment is more likely to increase a fever rather than reduce it. The same goes for a cold shower. You should also avoid alcohol baths, especially in treating children, and not piling on the blankets. A better option is to bathe with lukewarm water, which helps to break the fever. If you need another good reason not to smoke, consider this. If you already have a cold or the flu, smoking and secondhand smoke will further irritate your throat, nose, and lungs. They can also make you more likely to catch a cold or flu in the first place. Even worse, smokers are more likely to die as a result of a cold or influenza, according to the CDC. This may be because the airways and nasal passages of smokers are already inflamed, which makes it tougher for them to heal. 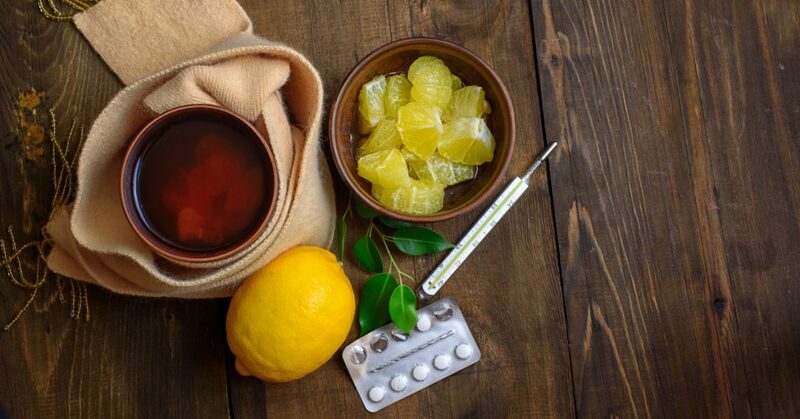 The best cold and flu treatment may be to simply stay home and rest. You’ll not only get over the flu faster, you’ll be less likely to spread the virus to coworkers. The CDC recommends staying home for at least 24 hours after you’ve been fever-free, without the help of fever-reducing medications. Most cough suppressants contain too little medication to do much good, anyway. Worse, they can be dangerous in certain situations. Those containing opioids should never be given to children. You should also be careful about mixing products with acetaminophen, such as Tylenol® or Nyquil™. Going above the recommended daily dosage of 4,000 milligrams, even slightly, can lead to severe liver damage. Skip those antibiotics, too. Colds and influenza are caused by viruses, not bacteria, so antibiotics won’t help. Antiviral medications are the best treatment for cold and flu symptoms. As tempting as it may be to lie flat on your back, this is not how to treat the flu or a cold. Although rest is important, lying flat can be tough on your lungs. Try reclining while sitting upright, instead. This helps keep head congestion from settling into your chest, and causing you to cough. If you’re fighting off a cold or flu virus, trust your gut when it comes to eating. There may be a reason you have a sudden craving for hot soup. The steam from the broth will help clear your sinuses, and in turn, improve your sense of smell. This will make you more likely to enjoy other foods, as well. Don’t forget to “get plenty of fluids” when your trying to get well because your body needs the extra hydration. Fluids that help ease symptoms include water with lemon (hot or cold), ice chips, clear soup/broth, or decaf tea. While exercise may be good for you, it’s not how you should treat the flu. Strenuous activity while you’re sick causes you to sweat at a time when you should be staying hydrated. Skip that 10-mile run until you’re well again. When all else fails, seek medical help. If you’ve been sick for more than two weeks, with no signs of improvement, or you develop new or worsening symptoms, call a doctor. Other signs that it may be time to seek help include a sore throat and fever above 100 degrees that lasts longer than three days. Serious chest pain and shortness of breath also require immediate attention. If you need treatment and can’t get in to see your doctor, head to your nearest neighborhood FastMed clinic. We welcome walk-ins 7 days a week, 365 days a year. To save time, check-in and register online before you arrive.